95% of the international industry around start-up companies and VC investment in them was once concentrated in the USA. Today the USA is still a major hub of start-up and VC activity but its share of the global market has dropped to just over 50%. Is that simply an inevitable, natural and positive trend that reflects global economic development? Or has the USA started to go stale as a hotbed for entrepreneurial spirit? Has corporate America lost sight of the fact it was the ‘American Dream’ philosophy and environment that allowed its mega-corporations to be nurtured and grow to the point they straddle the global economy? Silicon Valley, the area found beyond the southern shores of the San Francisco Bay, is still undoubtedly the name most associated with the latest technology in the world. But for some time now, with prices of property and office space in the region having reached eye-watering levels, it has gradually been losing its ‘must be there’ status for U.S.-founded start-ups. Seattle, Pittsburgh, Detroit, Cincinnati, and Nashville are just a few of the other more affordable cities and locales now viewed as viable alternatives to the once mandatory pilgrimage to Silicon Valley. However, of more concern for the U.S. start-up and VC scene is that the incubators of the kind of technology companies capable of changing or creating entire industries are not only fanning out around the 50 states. VC investment is now also spreading its net and finding many of the start-ups they put their capital into in other parts of the world such as Europe and particularly Asia. Over half of the ground the U.S. has lost from the days 25 years ago when 95% of the VC-led start-up investment industry took place within its borders has been given up over the last five years. And the pace at which that decline is happening is not easing off but continuing to accelerate. That data is based on numbers put together by PitchBook, a company that offers market intelligence on start-up funding trends and data. Unsurprisingly, it is China which has contributed most to the U.S.’s loss of dominance in the sector, accounting for almost a quarter of total VC investment in 2017 compared to 4% in 2005. India is getting close to 5%, and has now overtaken the UK as the country whose start-ups are in third place when it comes to attracting investment capital. Given the size of the country, it has the potential to take a similar trajectory to that which China has been on for the past decade or so. While the UK is just behind India, the reality is we can expect the gap to widen in coming years, though our own island does have a thriving tech start-up scene and can be expected to continue to attract capital. Just this week reports have suggested Softbank’s $100 billion VisionFund, the world’s biggest tech investor is in negotiations with UK fintech start-ups Revolut and Oaknorth. Other major European countries attracting VC funding to their start-up scenes and ranking in the world’s biggest by value include Germany, France and Sweden but lower cost countries such as Portugal and the ex-Soviet bloc states in Central and East Europe also have thriving environments. In Asia, Japan has reawakened its taste for technological innovation and takes 10th spot. Israel has a thriving investment environment and Singapore is also on the up. 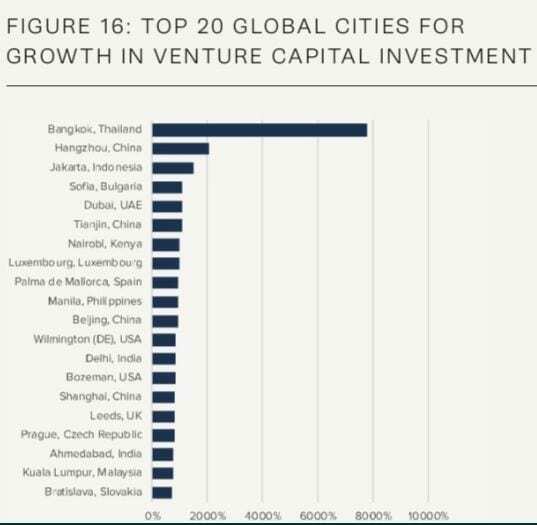 Cities on the up in terms of the pace of growth in VC investment include Thailand’s Bangkok in first place, followed by Hangzhou in China and Indonesia’s Jakarta. The conclusion must be that in future years we can expect the biggest new game-changing tech start-ups will be more evenly spread across the globe than they have been until now. It’s not even that the USA is in decline when it comes to VC investment in start-ups. Capital investment figures continue to rise and reached $90 billion in 2017. Growth is in fact a whopping 160%. But it’s 375% internationally. It’s simply that the rest of the world is catching up with Silicon Valley. That should be to the benefit of all of us wherever we may be around the world. Oil Prices to Rise Again as Saudi Arabia Signals Renewed Supply Cuts? What Does The Data Economy And Data as Currency Really Mean And How Can You Invest In It?